Just picked today! Fresh strawberries, though half were eaten before I had a chance to take a photo :) They were delicious. Potatoes are looking and tasting really good. These were boiled and put into salad for dinner. They are so much tastier and creamier than store bought potatoes. Are you nutritionally confused? Trying to eat Vegetarian or Vegan and not sure whether you are heading in the right direction? Sign up for my VegUcation Series and Plant Based Nutrition Support Groups at the Florida School of Holistic Living! You can also bring these workshops and support groups to your home or office. Find out the myths about Dairy and Bone Health and what foods and lifestyle practices you really need for healthy bones. You will also learn how to make your own nut milks and a simple kale dish. Oils are not health foods, understand the latest science and how to prepare delicious meals without foods. Food demo: oil free salad dressings with mixed salad greens (from my garden! ), how to sautee without oil and bake with minimal oil. Sample a veggie stir fry and muffins. Just when I thought I couldn't eat anymore salad...here comes more! Here it is! Another easy and delicious collard recipe! This one has beets and lettuce from our garden and a homemade Spicy Peanut dressing. We can eat two or three of these with a bowl of papaya for lunch and we're good to go. The dressing is from the Moosewood Restaurant Lowfat Favorites cook book. I got this cookbook for $1 at the Unitarian Church Thrift Store! What a steal and so many great recipes, some that are Lacto-ovo Veg and can be easily made Vegan. Put all ingredients in a high powered blender or food processor and blend until smooth. Enjoy! It stays fresh in a sealed glass container for up to 3 days. This is my new favorite recipe! It is similar to Dr. Fuhrman's Banana Cashew Lettuce Wrap. I just decided to change it up with using collards and sliced apples. And it kind of looks like sushi...sort of? I've been using the collards to wrap my salad in ever since I found out my favorite vegetarian cafe in Orlando, Dandelion Communitea, will wrap any salad menu item in a collard leaf instead of a whole wheat tortilla. It is sooo much better than a tortilla! They will actually pluck the collard straight from the garden on the side of the building! That makes it gluten free and more nutritious :) We don't have any collards in our garden yet, but I have been enjoying the ones from Everything Organic, a food co-op you can buy organics from at the Winter Park Farmer's Market on Saturdays. Spread the cashew butter on the stem area of the leaf. Lay the banana on the cashew butter then place apple slices on the sides. Drizzle some Agave nectar over the top and wrap the collard leaf around the fruit. Simple as that! ﻿Have a garden at your house? Please share what you are growing in your garden in the comments below! This month, PCRM president Neal Barnard, M.D., will return to PBS stations nationwide. His new program, Kickstart Your Health, is based on the concepts in his just-released book "21-Day Weight Loss Kickstart". The hour-long program is packed with information on how a plant-based diet will help you drop pounds, lower cholesterol and blood pressure, and improve blood sugar levels in just three weeks. To view a clip from the program, click on the Kickstart Your Health Graphic above. I decided to take the kids to Cafe 118 this week as a treat, seeing how I had a nice $25 off coupon from Restaurant.com. (Thanks Patience!) I've only taken the kids to have a smoothie, not a sit down meal, so they were excited about it. ﻿The only thing they enjoyed was the hummus and the salad. Everything else was either "too spicy" or "didn't taste right". The Pad Thai was way spicier than what I like so of course it was too spicy for them. I should have asked about that, but now I know. I also forgot to ask for the dressing on the salad to be on the side- it was too much oil. Well seeing how we don't use oil at home, anything with oil in it is too much. If you have tried Cafe 118 with your kids, what menu items did they like? Post in the comments below! I made Almond Milk on the last day of class for my Plant Based Nutrition & Wellness Bootcamp at the Florida School of Holistic Living. One of my students asked "can we make milk from cashews"? Well, yes, you can make milk from any nut, seed or oats! I've even heard from one of my friends that she makes Zucchini milk and I've not tried that yet. I noticed on FaceBook last week that my student had posted a link to a cashew milk recipe with oats. I decided to simplify the recipe and turned out as delicious as I expected. If you need detailed steps on how to make nut milk, go to my older post on "How to Make Almond Milk". The authors of the Vegan Backpacker blog are announcing a new project called "Vegan Cuts", a membership website that will feature weekly deals on vegan products and services. This idea was born out of their "love for buying vegan products and saving money". Vegan Cuts needs your help! Their goal is to register 1000 members during the first month and start sending deals in late April. 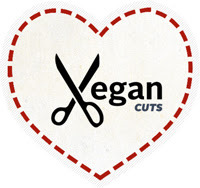 Visit Vegan Cuts using my affiliate link. Create an account and spread the word to your vegan friends by sharing the link on Facebook and Twitter. There will be an extra special prize for the person who refers the most new members during the registration period. Register today and they will send you a special referral link to share with your network. I have two related events to announce! First, Melanie Joy is coming to Orlando to talk about her latest book, Why we Love Dogs, Eat Pigs, and Wear Cows. She will be speaking on March 19th at 6:30pm at UCF's Public Affairs Building I, Room 119. Her presentation will explain the psychology of eating meat; the impact of meat production and consumption on our mind, body, society, and planet; and how individuals can make more informed and empowered choices as citizens and consumers. Melanie is a social psychologist and professor of psychology at the University of Massachusetts, Boston. She holds a Ph.D in social psychology from Saybrook Graduate College and a master’s degree in teaching and curriculum from the Harvard Graduate School of Education. She has written numerous articles on psychology, animal rights, and social justice, and is also the author of the activist handbook Strategic Action for Animals. To RSVP for this event, please go to the Meetup site for Vegetarians of Central Florida. Second, A Better World Book Club will be discussing Melanie Joy's book on March 23rd at 7pm, Rhapsodic Cooperative. These events are both near World Meatout Day on the 20th. So if you are looking for a reason to give up animal foods and transition to a plant based, vegetarian or vegan diet, these are excellent events to attend! Many know the health benefits of eating less animal foods but need to look at things from a compassion angle to make the changes stick. Here's what you do when you don't know what to do with your kale or when it's starting to look old. I buy at least 4 bunches of Organic kale a week and at the end of the week I juice any leftover bunches with whatever fruit is starting to look less than fresh. Last week we finished off all the fruit by Saturday morning so I went and picked oranges off our tree in the backyard to mix with the kale juice. It is super easy to make, but you need a good juicer! Cut the oranges into quarters and remove the orange from the peel. You cannot juice the peel, it will give too strong of a taste. If you have a citrus juicer, you might want to use that instead. I just don't like to pull out multiple appliances. I don't like the cleanup :) If you have an Omega juicer like me, you will get a good amount of pulp from the kale. You can save that and put it back into the juice, put it into a pasta sauce for dinner or put it in the freezer to add to a smoothie later. My kids love this juice. They get a nice green mustache when they drink it. That beats a milk mustache hands down. 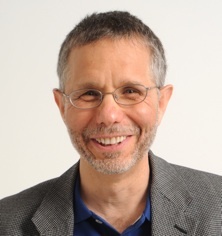 This guest post is written by Jeff Novick, MS, RD, LD, LN. and shared on whatahealthyfamilyeats.com with permission. Part 1 of this article is here. Jeff has over 24 years of experience in nutrition, health, fitness and natural living. He offers expert health advice distilled into powerful, easy-to-understand language on a variety of current topics. Jeff’s insightful and humorous approach to nutrition and health has helped thousands worldwide make the transition to healthy living. He has written and produced a variety of informational and entertaining DVD's on health and Plant Based Nutrition. The following question is one I am frequently asked. It is about he impact of "just a little olive oil." Q: I know that it is best to order (or make) steamed vegetables. If I were to order (or make) vegetables with a 'little" olive oil, how much olive oil do you think is usually used in proportion to the vegetables and how bad would that be? A: No one knows for sure. And little amounts can have a big impact since oil is the most calorie dense food there is. And, while vegetables are the lowest in calorie density, the impact of even small amounts of oil on the vegetables can be huge. In addition, in spite of all the health claims, olive oil is a very rich source of calories and, in addition, 14% of the calories in olive oil come from saturated fat. The current recommendation from the American Heart Association is to limit our intake of saturated fat to no more than 7% of calories. Personally, I think less than 5% is better. Now, this is a great question because everyone always wants to know, "how bad is a little of this" or "a little of that." Your question, will give us an opportunity to look at this issue in detail. Let’s say you ordered a plain side of steamed vegetables. For every 1/2 cup serving of steamed vegetables, that would be about 25 calories. So, even a larger 1 cup serving would be only 50 calories. Olive Oil, like all oils, is 40 calories per tsp. So let’s see the impact. 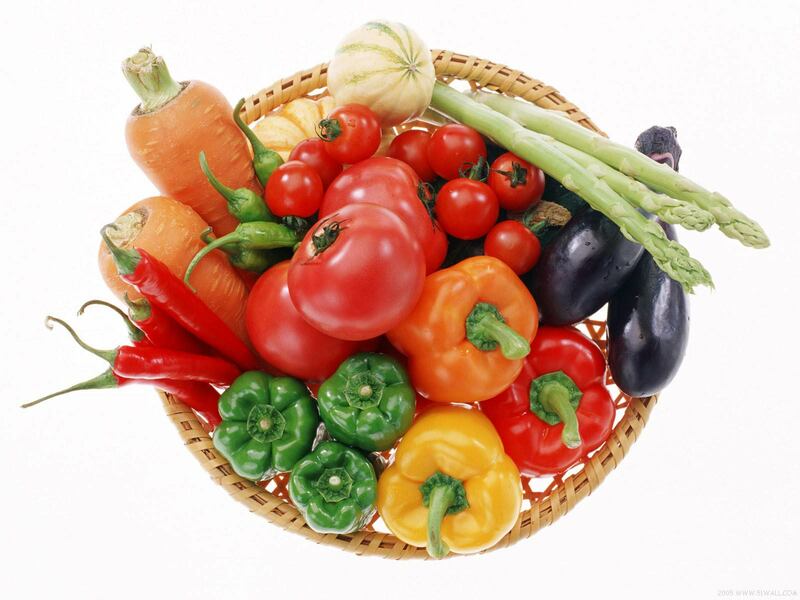 In addition, in regard to saturated fat, the vegetables would have virtually none. But by adding in the olive oil, the side dish is now about 10% saturated fat. As we can see, the impact of the oil on the vegetables, at this level, is dramatic and that is just for a tsp. of oil. If we add 2 tsp. of oil to a 1/2 cup serving of steamed vegetables, we would raise the total calories from 25 to 105, and the majority of the calories (76%) would now be coming from oil. This side dish is also now 11% saturated fat. If we add 3 tsp. of oil (which is the same as one tablespoon) to a 1/2 cup serving of steamed vegetables, we would raise the total calories from 25 to 145 and the majority of the calories (83%) would now be coming from oil. The side dish is now also 12% saturated fat. For those of you who eat more than a serving of vegetables at a time, let’s see the impact of the oil on the vegetables if we double the side dish of vegetables to 1 cup, which, according to traditional serving sizes, is 2 servings of vegetables. If the serving of veggies is 50 calories (1 cup), even just 1 tsp. of oil would raise the total calories from 50 to 90 and almost half of the calories (45%) would now be coming from oil. In addition, in regard to saturated fat, the vegetables would have virtually none, but by adding in the olive oil, the side dish is now 7% saturated fat. If we add 2 tsp. of oil to the 1 cup serving of vegetables, we would raise the total calories from 50 to 130 and the majority of the calories (62%) would now be coming from oil. The dish is also now 9% saturated fat. If we add 3 tsp. of oil (which is the same as one tablespoon) to one serving of vegetables, we would raise the total calories from 50 to 170, and the majority of the calories (70%) would now be coming from oil. The side dish is also now 11% saturated fat. As we can see, the impact of even a little oil on typical serving sizes of vegetables is dramatic. Now, remember, this analogy is with olive oil, which is supposed to be one of the healthier oils. Imagine the negative impact a little coconut oil, which is over 90% saturated fat (with about 30% of the calories being the worst saturated fats), would have in the same scenario. So, let's look at the impact of even a little oil on a large amount of salad and/or vegetables. Let's use a pound of steamed greens, which, for the record, would be about 3.5 cups of steamed kale. A pound of steamed kale is 125 calories and is 1.4% saturated fat. Adding 1 tsp. of oil would raise the total calories from 125 to 165 and 25% of the calories would now be coming from the oil. In addition, in regard to saturated fat, by adding in the olive oil, the side dish is now 5% saturated fat. Adding 2 tsp. of oil would raise the total calories from 125 to 205 and 40% of the calories would now be coming from the oil. In addition, by adding in the olive oil, the side dish is now almost 7% saturated fat. Adding 3 tsp. (1 TB) of oil would raise the total calories from 125 to 245 and almost 50% of the calories would now be coming from oil. By just adding 3 tsp. of oil to a pound of veggies, almost half the calories now come from the oil. In addition, by adding in the olive oil, the side dish is now almost 8% saturated fat. In my personal and professional opinion as both a RD, a former chef and a frequent visitor of restaurants, a TB of oil, if not more, is what many people are using (or getting) per typical serving of food/vegetables, which as we can see, can have a huge impact. But, you actually may be betting much more. So, let’s do one more example with 2 TB of oil. Adding 6 tsp. (or 2 TB) of oil would raise the total calories from 125 to 365 and 65% of the calories would now be coming from oil. In addition, by adding in the olive oil, the side dish is now 10% saturated fat. And this is playing out in homes and restaurants every day under the mistaken guise that oils, like olive oil are healthy for you. For example, I was in an Italian restaurant a few weeks ago that is supposed to be known for its "healthy" food. One of the members of the party I was with was trying to order a "heart healthy" meal. She ordered pasta primavera with a plain tomato sauce and specifically requested it be cooked with "as little oil as possible." When the dish came out, there was so much oil in the plate, she asked for a second plate so she could lift out the pasta and veggies from all the oil and put them in a new bowl. After she did this, we looked at the remaining oil in the original plate and there had to be over 1/2 cup if not more, of oil left in the original bowl. A 1/2 cup of oil is the equivalent of 8 tbsp. Imagine the impact this would have had on someone trying to eat "Heart Healthy." Even though she removed the pasta she was going to eat from all this oil, we still have no idea how much oil was still left in the pasta, veggies and sauce. Instead of using oil, try sprinkling some balsamic vinegar and/or some lemon juice on your veggies along with some fresh herbs/seasonings. Balsamic vinegar has only about 5 calories per tbsp. and has no saturated fat. It will also add lots of flavor without adding any of the extra calories, fat and saturated fat that is in olive oil. This is a real win/win/win. It is time to clean up America's dietary oil spill. FARM (Farm Animal Rights Movement), the organization that is promoting World Meatout Day, is "a national nonprofit organization promoting a vegan lifestyle through public education and grassroots activism to end the use of animals for food". The organization believes in the inherent self-worth of animals, as well as environmental protection and enhanced public health. 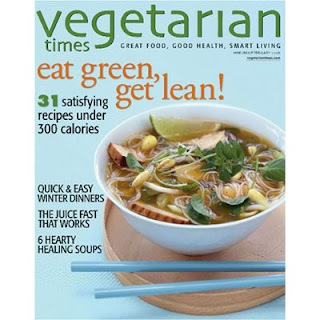 I just noticed today that a 1-year subscription to Vegetarian Times on Amazon.com is only $7.00! This a great deal for a resource that provides you with new recipes and information about the vegetarian lifestyle every month. To check it out click on the picture above! The Spring Open House at the Florida School of Holistic Living is March 12th, from 11-3pm. There will be mini-demonstrations, sample green smoothies (made by me! ), kombucha, and herbs, and an opportunity to meet teachers at the school. There will be "special spring semester tuition discounts, local refreshments and great friends will round out the day". This a great opportunity to come and check out the school and ask questions about upcoming classes. Hope to see you there!